The infrared spectrum originates from the vibrational motion of the molecule. The vibrational frequencies are a kind of fingerprint of the compounds. 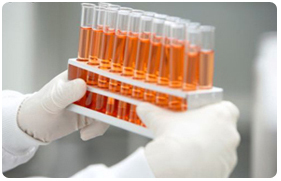 This property is used for characterization of organic, inorganic and biological compounds. The band intensities are proportional to the concentration of the compound and hence qualitative estimations are possible.The IR spectroscopy is also carried out by using Fourier transform technique. The interference pattern obtained from a two beam interferometer as the path difference between the two beams is altered, when Fourier transformed, gives rise to the spectrum. The transformation of the interferogram into spectrum is carried out mathematically with a dedicated on-line computer. The Perkin Elmer Spectrum1 FT-IR instrument consists of globar and mercury vapor lamp as sources, an interferometer chamber comprising of KBr and mylar beam splitters followed by a sample chamber and detector. Entire region of 450-4000 cm-1 is covered by this instrument. The spectrometer works under purged conditions. Solid samples are dispersed in KBr or polyethylene pellets depending on the region of interest. This instrument has a typical resolution of 1.0 cm-1. Signal averaging, signal enhancement, base line correction and other spectral manipulations are possible. sample required 50 mg, solid or liquid. Infrared spectrum is useful in identifying the functional groups like -OH, -CN, -CO, -CH, -NH2, etc. Also quantitative estimation is possible in certain cases for chemicals, pharmaceuticals, petroleum products, etc. 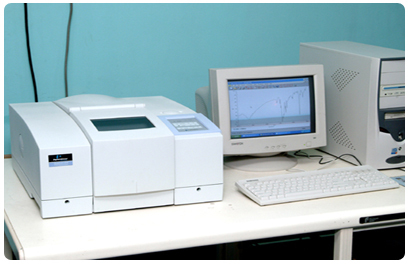 Resins from industries, water and rubber samples can be analyzed. Blood and food materials can also be studied. Reaction mechanisms and concentration studies are done.